Mobile commerce is booming globally and it turns out Filipinos have joined the trend. According to online firm Picodi.com, half of transactions were made with the use of a mobile device last year. When Filipinos did shopping with the use of a phone, the average order value was ₱3,997. It’s about ₱382 more than when using desktops (₱3,615) and ₱138 less when using tablets (₱4,135). iOS users spend more than Android users — ₱4,605 vs ₱3,958 on average. The important question is who shops online more — men or women? Data showed that there were more purchases made by Filipino women than those made by men, 62% and 38% respectively. Unsurprisingly, it’s the young generation that prefers online shopping. More than half of all online shoppers (52%) are people between the ages of 25 and 34. They’re followed by people aged 18-24 (26%) and 35-44% (13%). The remaining 9% are consumers who are over 45 years old. According to the research, the average order value of a Filipino shopper is the highest in June (₱5,409), followed by May and March (₱4,494 and ₱4,143 accordingly). Compared to that, the average order value of a moderate ₱3,604 in November might come as a surprise. After all, that’s when Black Friday and 11.11 take place. Filipinos shop in a number of different online stores and place more orders. November has the highest number of transactions — 15.4% of all the transactions made during the year. The same number of transactions was noted in December (15.4%), followed by January (13.2%). Last-minute Christmas shoppers might have greatly contributed to such a high number in the former month. The lowest number of transactions was noted in July (2.3%) with the average order value amounting to ₱3,618. Consumers in the Philippines shop the most on Friday. Filipinos definitely prefer to shop in the afternoon: the peak of sales occurs between 12 PM and 6 PM. 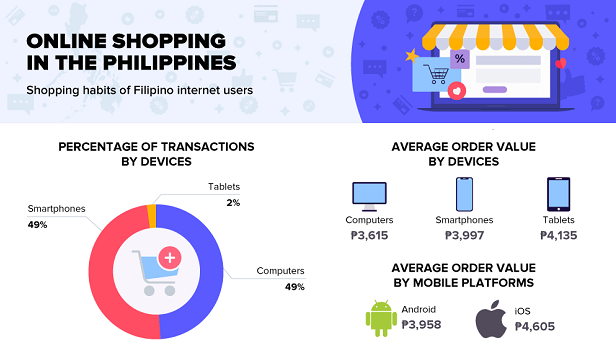 The most popular categories for online shopping among Filipinos were: food on delivery, clothing, grocery, cosmetics and perfumes, and electronics.